Fire officials said there is evidence accelerants were used during the fire and a criminal investigation is underway. 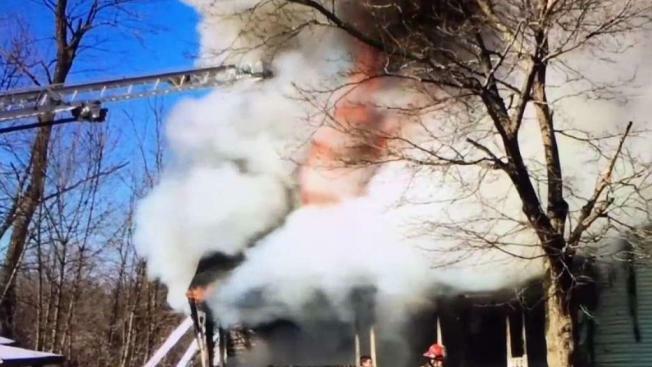 Four people were forced from their home by a fire in Manchester Thursday and police said the cause appears suspicious. A criminal investigation is underway into a fire on School Street in Manchester Thursday that left five people forced from their home. Fire officials said they were called to the home at 151 School Street around 2:21 p.m. When crews arrived there was heavy fire coming from the first and second-floor windows and heavy smoke from the attic. Live power lines across the street and front lawn caused firefighters to take extra precautions. Neighbor Brenda DuBois called 911 and said the fire poured through the windows. "Flames on the second floor, a lot of black smoke, live wires dangling, the sound of windows popping, glass breaking," said DuBois. Firefighters had received reports that there might be people trapped, but when they swept the home they found no one. "We were able to do a search and get in and verify no one was in the house. That was our largest concern," said Manchester Fire Chief David Billings. Manchester detectives remained on scene hours after the fire was put out, and the State Fire Marshal was called in to assist. "It is unusual for a fire to be that far advanced in the middle of a sunny afternoon without neighbors seeing it. The fact that the fire started and advanced quickly just gives us a reason to take a closer look," said Billings. No injuries were reported. The building has been deemed uninhabitable until repairs are made. The homeowner is providing temporary housing for the displaced tenants, with assistance from the American Red Cross and Manchester Human Services. Billings said Friday that the local and state fire marshals deemed the fire incendiary and that there is indication that accelerants were used. A criminal investigation is underway.